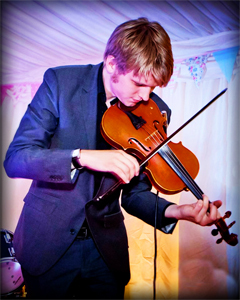 Ceilidhs are a popular way of adding an inclusive twist to an event and a great way to encourage guests to mingle. One of our experienced 'dance callers' will tell people what to do and generally we start out with easy dances and progress to slightly trickier ones if your guests are up for it. 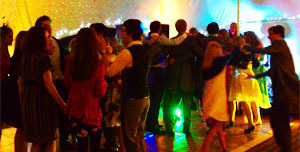 You don't need any prior experience of dancing as our expert caller will guide you through. Our emphasis is on fun not perfect footwork! Extras. We have been working in the trade for many years and know many superb musicians, just let us know if you need someone to pipe in your haggis or sing your favorite Irish drinking songs. We provide high quality, fully PAT tested PA equipment and LED lighting to ensure the band always sound and look fantastic. It's better than most DJ's equipment which is why many clients opt to hire our's to play their own music after the ceilidh for a great disco to round off the night.